Chinese mobile phone maker ZTE is reportedly gearing up for the launch of a new flagship Android-based device, one that might pack a Tegra 4 processor inside, and which is said to sport the model number ZTE N988 at the moment. The upcoming mobile phone is also said to pack a 5.7-inch touchscreen display, capable of delivering a resolution of 1280 x 720 pixels, which would make it similar in size with the ZTE Grand Memo. Furthermore, the handset is expected to pack 2GB of RAM inside, thus being capable of providing users with increased performance capabilities. However, a recent post on GSMInsider notes that, while ZTE might opt for Nvidia’s Tegra 4 CPU for the smartphone, a quad-core Snapdragon processor from Qualcomm could also be selected to power it. The hardware specifications list of the yet unannounced smartphone is also said to include an 8-megapixel or higher photo snapper on the back (most probably a 13MP sensor), as well as a front camera to enable users to make video calls while on the go. Additionally, ZTE N988 is expected to arrive on the market with Wi-Fi and Bluetooth connectivity packed inside, USB port, GPS receiver, FM Radio, and a microSD memory card slot for expansion purposes. Rumor has it that it would be set to hit the market in three color flavors, namely black, white, and red, and that it would be powered by Google’s Android 4.1.2 Jelly Bean operating system right from the start. Despite its large screen, ZTE N988 should weigh only 110 grams, mainly due to its thin design. The smartphone is said to measure only 6.9mm in thickness. 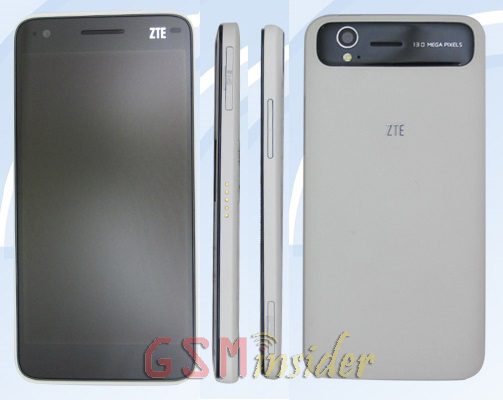 The available photos with the device show a design similar with that of ZTE Grand S, though various differences can also be spotted on it. Apparently, no carrier has been yet selected to bring it to shelves, though specific info on this might be unveiled in the not too distant future.